Intel has announced quite a lot of new products and technologies at the CES 2019. However, here at HEXUS we are most interested in its efforts in the desktop PC space, and our coverage will start with a focus on the latest Intel Core processor additions. In brief, the chipmaker has released six more 9th gen desktop CPUs with five models carrying the 'F' suffix meaning they lack integrated graphics and a new 6C/6T Core i5-9400 listed which does come with Intel's UHD 630 graphics. 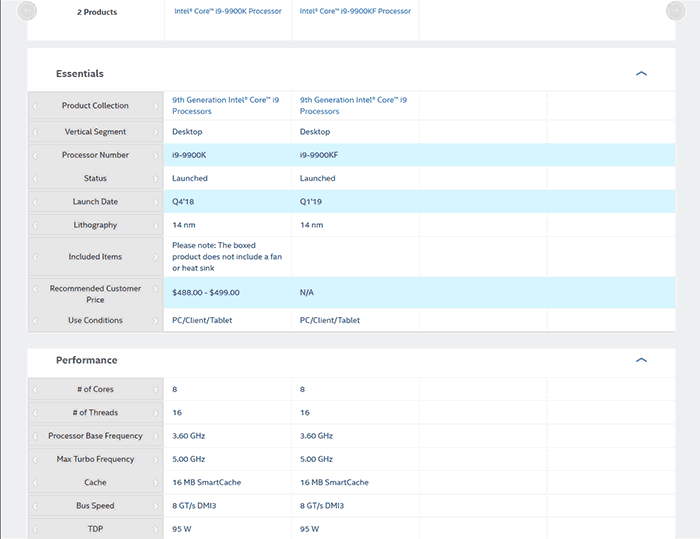 For brevity and clarity you will find the six new processors tabulated below, alongside key specifications, and links to their respective Ark pages - if you want to delve further into any particular chip, or set up a comparison table. 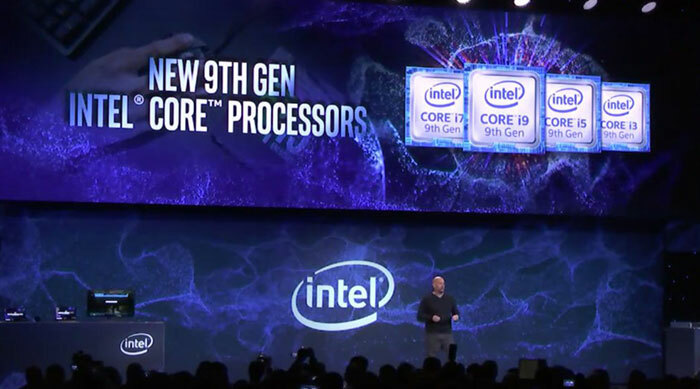 First of all, you will see above that there is a new Core i9-9900KF. For reference HEXUS reviewed the Intel Core i9-9900K back in October and which is currently available at around £530 in the UK. All the specs of this processor, and the i7-9700KF, and the i5-9600KF appear to be the same as their non-'F' suffixed counterparts except for missing graphics functionality. What that will mean in practice and product pricing remains to be seen (pricing still absent from the Ark). AnandTech reports that the iGPUs on these processors is present but disabled "likely in order to increase yield and perhaps improve binning". In my Intel Ark comparison of the new Core i9-9900KF and the Core i9-9900K I spotted some other minor changes which meant that the new 'F' suffixed CPU lacks; Intel vPro Platform Eligibility, Intel TSX-NI, Intel Stable Image Platform Program (SIPP), and Intel Trusted Execution Technology. The lower echelon trio of processors, the Core i3-9350KF, i5-9400F, i5-9400, are more new to us. The new 4C/4T Core-i3 is unlocked and lacks integrated graphics. This processor looks set for marketing to enthusiasts and overclockers. Lastly there are a pair of new Core i5 processors which vary only by the inclusion, or lack of, integrated graphics. These are multiplier locked 6C/6T parts which Intel has designed to run at base/turbo of 2.90GHz/4.10GHz for a 65W TDP. All the above desktop chips will become available later in January. Intel added that 9th gen mobile processors will arrive in Q2 this year. Removing virtualisation features and iGPU and calling it a new product. Well it's a lot better than disabling the above and keeping the product the same! Probably for a second or two before the thermal limiter kicks in, or the TDP swamps your power supply. MSI has announced its MSI Z390/Z370/H370/B360/B365/H310 motherboards support the new Intel Core I9-9900KF, I7-9700KF, I5-9600KF, I5-9400KF, I5-9400, and I3-9350KF processors.